Our company has earned accolades in providing Application Maintenance Service to the clients. Application Maintenance Service is widely demanded in the market due to excellent quality and accurate results. This service is provided at most affordable price to attain the maximum satisfaction of the respected customers. Apollo Wifin excels in Application maintenance, and Mobile support services that are reliable and affordable. These are value added services to our website development solutions on both web and mobile platforms. Our buzzwords are efficiency, timely delivery, agility and responsiveness. Budget: Depending on scope of the services. We support ERP installations on all latest releases for Rel 12. Support includes manage user issues on existing functionalities. Applications and websites require maintenance and support as your needs change and grow. Pegasus provides maintenance and support services freeing your in-house staff for newer initiatives. As needs for business changes constantly, application deployed to manage business also needs to accommodate business changes as well as additional features are required to be developed. so TatvaSoft assists you not only in customized application development but also maintaining them which ensures smooth operations and reduces the cost of redeveloping and redeploying applications. Customers that use SAP realize that implementing SAP is the first step in a journey. A journey of continuous improvement helps customers to use the SAP system optimally. This must be done while managing enterprise applications critical to your daily business operations effectively. Exa Tech India Pvt. Ltd.
Omron provides innovative solutions for various industries. You may select the applications that you are looking for by industry, work and process or product category. And with the Application Selector, you can define your search further by simply selecting the requirements that fit your needs. Research indicates that organizations spend an average of 73% of their IT budget on application maintenance of existing systems. Evidently, Application Management is an area of focus for organizations looking to contain costs. 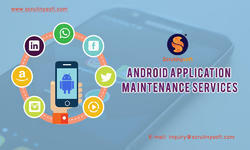 We are master in providing Application Maintenance Service to customers. Our core technical team has more than a 2 decade’s of professional experience in maintaining the applications for large enterprise. The application could be either on site maintenance or off-site. The Plat forms could be on any of the available technologies in the market.